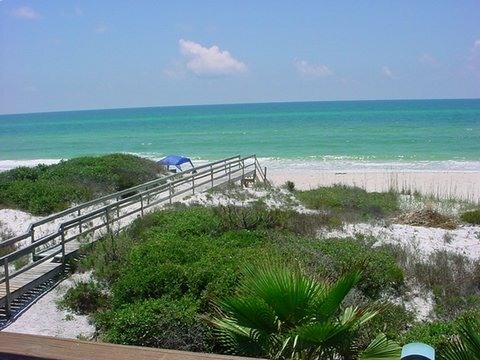 Gulf-Front Vacation Rental at Cape San Blas on Florida's beautiful Forgotten Coast. Three units available located on a lovely part of the beach. Each unit has 2br/2ba and is fully furnished including kitchen, cable TV, DVD, VCR, washer/dryer, wireless high-speed internet, and a phone. Upper and lower decks. Concrete parking. Faces west for great sunsets. Note: The queen sofa sleepers are for temporary overflow only. We do not provide linens for them. St. Josephs's Peninsula (Cape San Blas) was selected as the USA's most dog-friendly beach in 2006 by K-9 magazine (read the article). The Aqua Essence is a pet-friendly vacation rental. See Rental Information for details. Wireless internet access is available to all tenants, please call 850-527-8362 or email for the access code. If you have any questions or comments, contact .